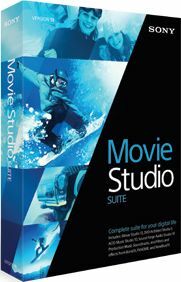 Movie Studio 13 Suite brings four impressive Sony applications together to produce a complete multimedia experience. Create video in beautiful 4K XAVC S or AVCHD, develop original music, and enhance multichannel audio. Take control of your own creativity and make movies that matter. Weave your ideas into high-quality videos that can be uploaded directly to YouTube and Facebook or burned to a DVD or Blu-ray Disc!